This DudaMobile Review will show business owners how to make a FREE Mobile Website that can get more web traffic, drive revenue and ultimately gain more customers. All of the information from your company website can be converted into a mobile friendly website that looks and functions great. 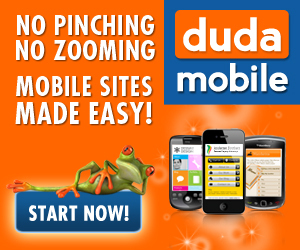 You can get all this for free from DudaMobile. Mobile websites are a must! Do you want to learn how to create a free mobile website? With the vast number of consumers who use their cell phones for everything they do, mobile shopping has become a huge trend. If your small business does not have a mobile website, you’re losing a lot of money on potential clients. If you handle communications for your church or synagogue, you need to understand why and how to make your website mobile friendly. You have probably seen the preponderance of mobile devices – smart phones and tablets in the hands of your flock before and after worship.